Our keyboardist, lead vocalist and music leader and is an accomplished musician with a music degree. He started his music career in and around the San Antonio area, and as a young musician, played with several big dance bands of his era. His talents noticed, Joe was given a unique opportunity to play for the Platters in Las Vegas and played with them throughout Europe for several years. His talent and experience keeps us on track and helps us produce a professional sound. Joe has also had a successful career as a school band director in several area schools and now enjoys his position as music minister for the St. Peter the Apostle Catholic Church in Boerne, Texas. Our bassist, acoustic guitar and country sound vocalist, has enjoyed many years of musical experience around the San Antonio and Texas dance halls with Jerry Riedel and the Sidewinders. His smooth baritone voice lets him showcase his ability to deliver the "George Strait" songs always in demand at most events. Additionally, folks are always pleasantly entertained when Jerry sings his "Neil Diamond" tunes. Jerry, now retired, had a successful career as a fire fighter and Fire Chief for the City of Castle Hills, Texas. He also enjoys his community involvement in Boerne, Texas. Drummer and back-up vocalist, has also played in local bands. His career at USAA Insurance Company and his love for music gave him many an opportunity to perform at many USAA-related functions. Always eager to take his drumming to the next level, Richard welcomed the opportunity to help create and play with The Vinyl Tones. 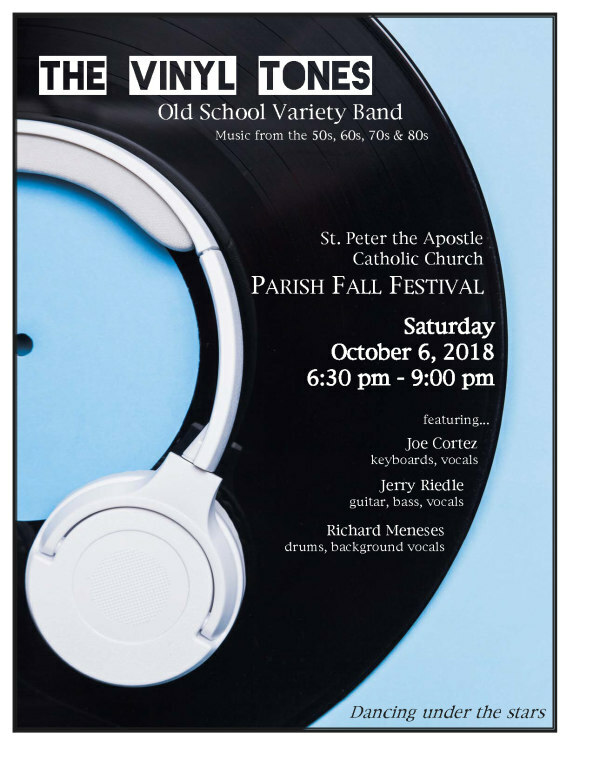 Currently, Richard plays drums for the St. Peter's Catholic Church Life Teen Band, along with Jerry as guitarist and vocalist and Joe as Band director and keyboardist. After he retired from USAA, Richard created another career as an independent insurance agent through Village Insurance Agency in Helotes, Texas.